Woodpeckers Backyard BBQ – The Tastiest Barbeque Around! 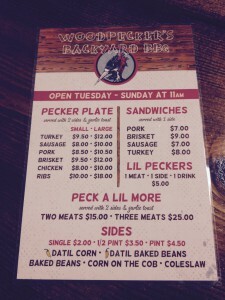 “Get it while it lasts” is the motto at locally owned and operated Woodpeckers Backyard BBQ! Woodpeckers is a newly opened barbeque restaurant located at 4930 State RD 13 near World Golf Village. They serve mouthwatering smoked barbeque that some would argue is the best in town! Woodpeckers opens at 11 am every day (but Monday) and serves its loyal clientele until the bbq runs out. The food goes fast due to their growing popularity, so it’s smart to grab an earlier lunch when you’re craving their tasty brisket, ribs, sausage, chicken, turkey or pork! When I make my weekly trip to Woodpeckers, I always opt for the brisket sandwich with datil corn. They incorporate datil pepper’s spicy flavoring into their corn, baked beans and some homemade sauces. Delicious! Other sides include regular baked beans, corn on the cob and coleslaw. Make sure to ask about their daily specials and desserts!